From about 6800 B.C, findings tell us that the culture Maglemose Culture was present on M�n. This was a culture which lived off fishing and hunting on mainland Denmark. Their implements were made of bone and small pieces of flint (microliths) such as harpoons with very fine flukes, spears of bone with microliths used as edges or flukes and axes made of deer antler. From this period a complete skeleton of an auroch has been found on M�n. Later Kongemose Culture appeared seemingly independent from the former Maglemose Culture. The Kongemose Culture lived along the coast and made implements from flint such as large well-made "splitters", arrows and solid-pointed weapons. Habitation from this culture has been found at Borre Mose. The landscape at that time was rich in hazel bushes and oak trees with alder also slowly being established in the area. In the period between 5400-3900 BC the vegetation finally covered the landscape with a completely inaccessible primeval forest which forced the last big animals such as the auroch and moose to find new living territories. The human cultures lived along the coast and were called Erteb�lle Culture. Findings from these cultures have been found around the island, their implements were made of flint stone and rock such as: rough but well-cut axes, chisels, pointed weapons, scrapers and harpoons. Habitations have been found around the eastern part of the island. Traces of settlements from this period have been found at Svinerumpen (discovered in 1904), at Klosterskov (discovered in 1871 by student Hother Hage), Far�, Kostervig, Sprove Strand and even recordings of a settlement behind "Taleren" at H�je M�n. The Kongemose Culture (c6000 BC � 5200 BC) was a mesolithic hunter-gatherer culture in southern Scandinavia, and the origin of the Erteb�lle Culture. It was preceded by the Maglemose Culture. In the north it bordered on the Scandinavian N�stvet and Lihult cultures. The Kongemose culture is named after a location in western Zealand and its typical form is known from Denmark and Sk�ne. 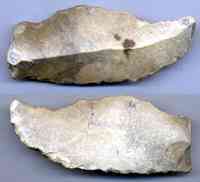 The finds are characterised by long flintstone flakes which were used for making the characteristic rhombic arrowheads, scrapers, drills, awls and toothed blades. Erteb�lle is a small village but is well known in internationally archaeological circles despite its size and has lent its name, the Erteb�lle Culture (c. 5000 - 4000 BC) to the historical period itself. The culture was discovered in the 1890s by the Danish National Museum when archaeologists excavated a gigantic heap of oyster and mussel shells near Erteb�lle and discovered that humans had not only created the heap but had more or less lived on top of it. The concept of the �kitchen midden� gained credence in European archaeological literature due to the discovery of the Erteb�lle Culture. Settlements established by this hunting and gathering culture have been found all over Denmark, Southern Sweden, and Schleswig-Holstein and along the North German Baltic coast.